At the end of June, our weather in Northern California went haywire. It stormed on Monday like it would in January. 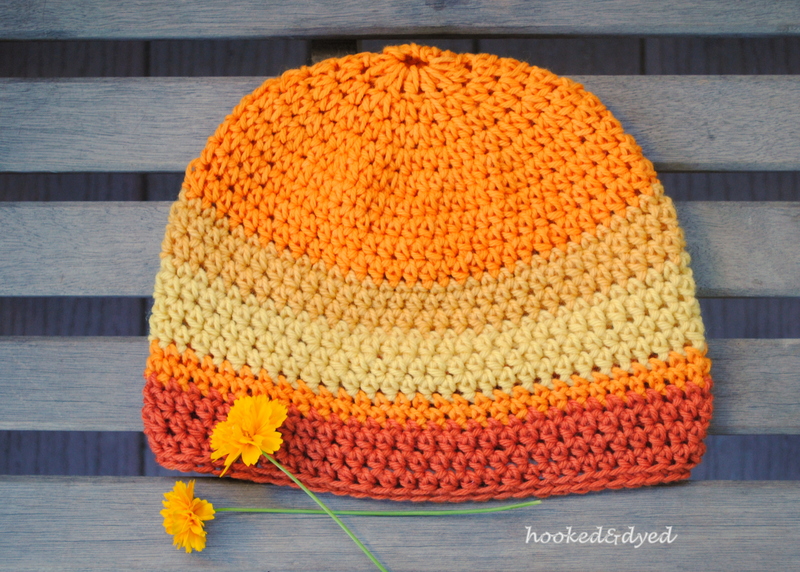 While cooped up in the house with chicken soup simmering on the stove, I felt an urge to crochet the yarn I dyed with coreopsis into one outrageously, vibrant hat that announced SUMMER! By the weekend, the rain dispersed and a heatwave hit. As I closed down the house early Saturday morning, wondering how I’d entertain three kids trapped inside, loathing the impending triple digit temperatures, it struck me that the heat was to my advantage: it’s ideal for experimenting with solar dyes. What do you need for a solar dye? I added 1oz of dried and fresh coreopsis blossoms into a half gallon mason jar, poured tap water almost to the top, put the lid on, and set it in the sun. After an hour or so I noticed the solution turned yellow. I added one skein of 1 1/2 oz of super-alum mordanted wool. Note: I’m calling it super alum mordanted wool because after I did a typical alum bath, I put the bath with wool skeins outside to cool and then forgot about it for a few days. More like a week. Oops. After two days, I rinsed the yarn, which turned a rich golden hue. 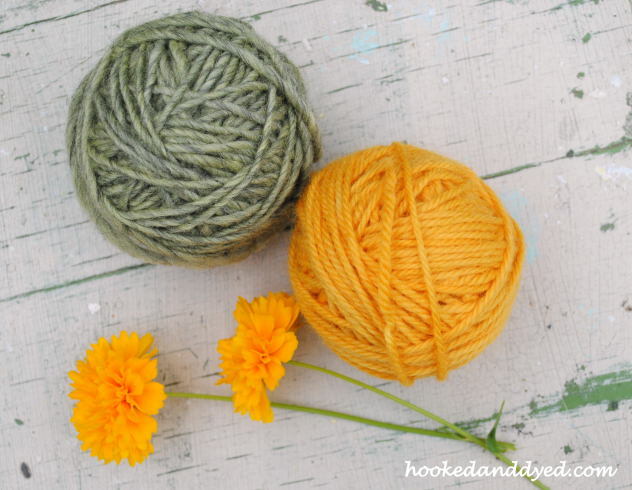 Next, I wanted to experiment with an alum mordanted gray skein to see if I could make green. This also sat in the bath for two days before I rinsed. It’s color is what I call moss green. Patience is required for solar dyeing. However, my patience is limited; the longest I let the yarn sit in a dye bath was 2-3 days. 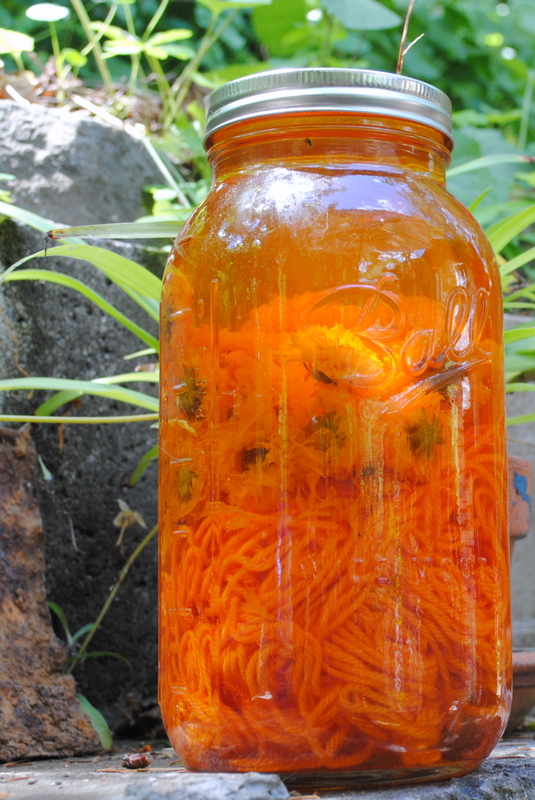 However, my mom Dorothy has been known to let her yarn soak in a solar dye for months. I don’t know how she does it. My colors may have darkened if I left them in the dye for longer than a few days, but I’m pleased with both the rich yellow and mellow green. My coreopsis plant is still producing an almost overwhelming bounty of blossoms, which I’ll continue to collect for solar dyes. During that heatwave I also experimented with blackberries. However, those dyes were semi-solar. Waiting a few days while watching the dye turn purple was impossible. But that story will have to wait until next time.